All the bolts and fasteners seem to be present, and snug. The fairing however, particularly the upper part that houses the instrument cluster, shakes a bit and is noisy (rattles) over bumps. The condition has worsened recently. Should I dismantle the assembly and install thin rubber shock mounts at critical points? The whole thing doesn't feel very solid-sort of a conglomeration of flimsy plastic pieces. '05 DL650. 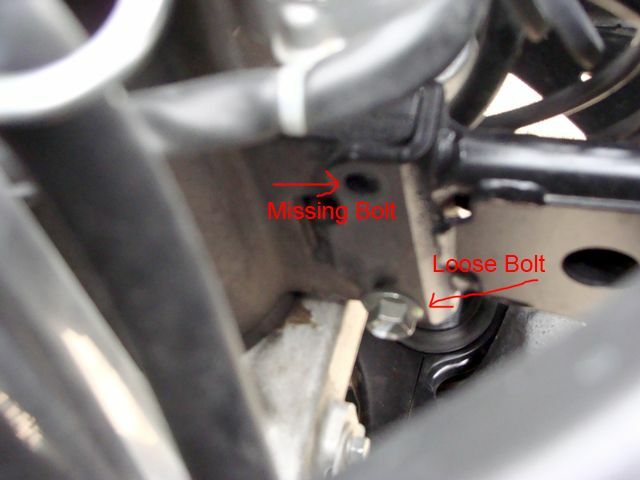 Did you check the two bolts holding the fairing frame to the main frame? Thanks Greywolf I didn't consider the possibility that the whole armature is loose. I'll check it out and see if I can access the bolts with the fairing still assembled. Look here; right on front of the steering stem head. These two bolts have a history of backing themselves out. They should have threadlocker on them from the factory, but they don't. Thanks guys. The top one is present and fairly snug, the bottom one is missing. I'll pull the top one and match to another bolt. BTW Greywolf, did you catch this recent story from Canada? I hadn't. I wish people would leave the wolves alone and they'll leave people alone. Thanks Greywolf! This site is the best! At the end, he mentioned the front fairing and windshield seemed loose, moving a lot on the dirt roads and on bumps. Fine on smooth pavement. Yesterday I went to fill up with gas, and sure enough I noticed the loose front fairing. I searched this site last night, came to your picture (worth 2000 words) and checked it out today. Sure enough, the top bolt was a bit loose, but the bottom one was more than 3/4 out! Blue loctite, and now they are in tight! Ill test ride tomorrow, but looks good! I wish all my problems could be so easily solved by looking on Stromtrooper.com. Last edited by greywolf; 08-08-2016 at 06:21 PM.